Coming To Terms With Simplifying. Greetings! I’m still thinking about this idea of simplifying. 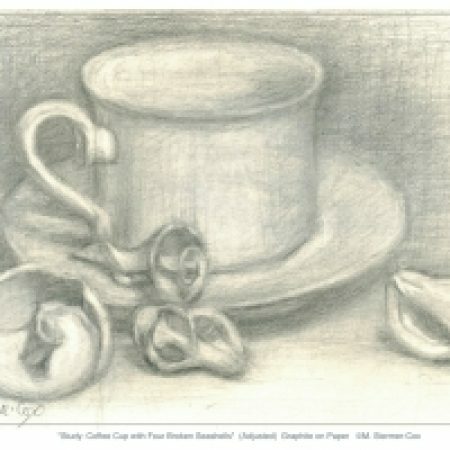 In this article, I speculate about where the concept of simplifying fits in the composition lexicon for drawing and painting. Yes, this is the kind of thing I contemplate on from time to time. And, if you think that I’m obsessing about simplifying then you would probably be correct! 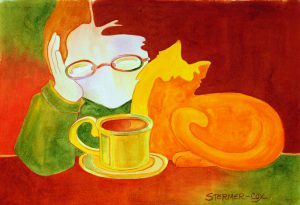 The situation is that I am working on getting my thoughts and experiences organized. 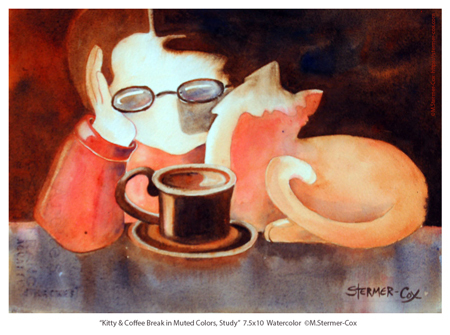 This is because I’m scheduled to lead a mini workshop on simplifying to the Watercolor Society of Oregon. And, I want to be able to communicate ideas clearly. So, as you might imagine, I’m doing some research and study. However, I’m finding that when one does a search “simplifying in drawing and painting composition”. You see, its been oddly difficult finding relevant results. So, instead, I’m trying different searches and looking in my art books. 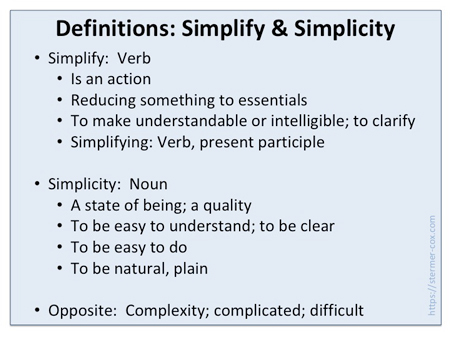 How Does “Simplifying” Fit In? Because of the scarcity of information, I wanted to figure out where this concept of “simplifying” fits in the lexicon of composition. Perhaps I’ll be able to do better searches or at least articulate what “simplifying” is all about. 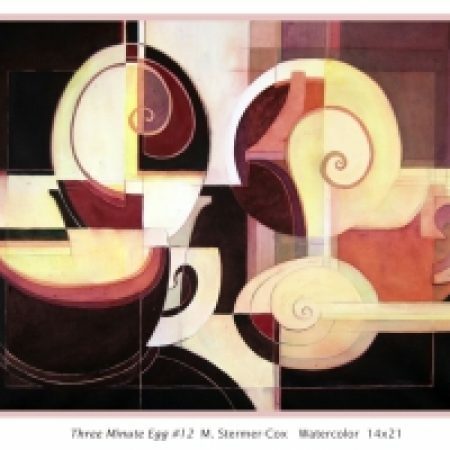 To restate the problem, what does does it mean to simplify as it applies to designing a painting? 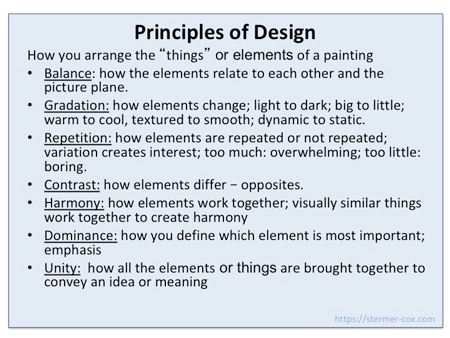 And, how does this process fit with the elements and principles of design? Furthermore, isn’t Minimalism simplification taken toward the extreme? In a manner of speaking, the answer to the Minimalism question is yes. The Tate Museum, for example, defines Minimalism as an extreme form of abstraction typified by big simple geometric shapes. Come to think of it, abstraction is linked to simplifying too. You might want to refer to the Tate’s definition of abstraction. It includes the following line. Can you see where my brain might just go around in circles? Back to composition or design (a short digression)! 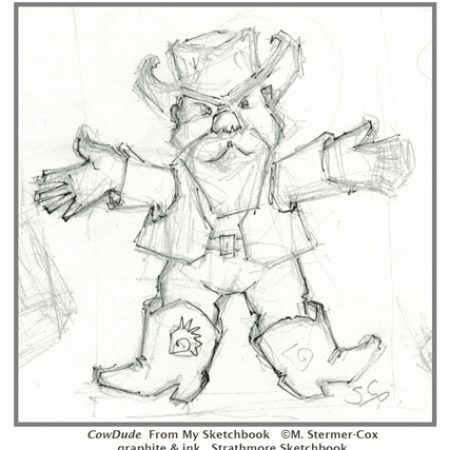 You might want to know that I use the terms composition and design interchangeably. I’m referring to the same thing; how we organize elements on the picture plane. In any case, the concept simplifying is not a design element or a design principle. So, how does it fit? I’m thinking its an over-arching “approach” and therefore is fits indirectly. 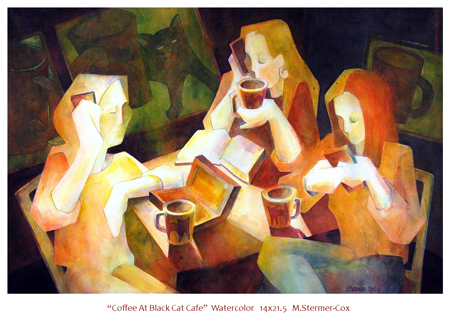 I thought I’d use one of my paintings, “Coffee At Black Cat Cafe” as an example of simplifying by linking or massing shapes. While this painting may seem complicated, and it does to me, I have taken steps to simplify shapes to promote unity. If you would like, please take a look at the three figures. The two figures at the right are linked by their adjacent arms, creating a bigger shape. The figure on the left sits alone; she is my center of interest. Also note that the figures and the table are depicted in similar warm colors. Thus, I am linking the smaller shapes into a single larger, triangular shape. In this example, then, I use both shape and color as the design elements for simplifying. The action of simplifying (linking or massing the shapes) promotes unity, which is a design principle. I just noticed that both of the paintings I’ve selected show places where I’ve simplified. The figures, for example, are simple. That is to say, I haven’t put in a lot of the details about bone structure, muscles and features. I’ve left that to your imagination. Furthermore, the color schemes are relatively simple or restrained. Come to think of it, how about you? For those of you who are artists, how do you simplify shapes, colors, values and other design elements in your own work? 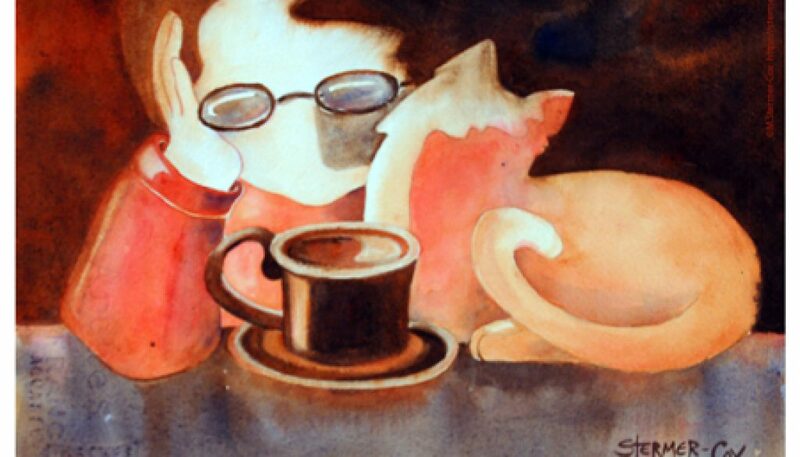 And, for all of us who appreciate art, have you noticed simplification in other works of art? Consider again, then, the words “to simplify” and its opposite “to complicate”. Don’t the terms imply action? In the act of designing a drawing or painting, I would suggest that we’re talking about how we arrange things on the picture plane. To put it another way, to simplify or to complicate refers to the ways in which we arrange or apply the design elements in accordance with the design principles. For more, you might want to see my article on silhouettes. Or, you might want to check out artist Frank Eber’s blog post: “Simplifying a Scene”. John Burton, Tucson Art Academy, has a short video titled “3 Key Steps to Simplifying A Complex Scene” that I think is good. Update! 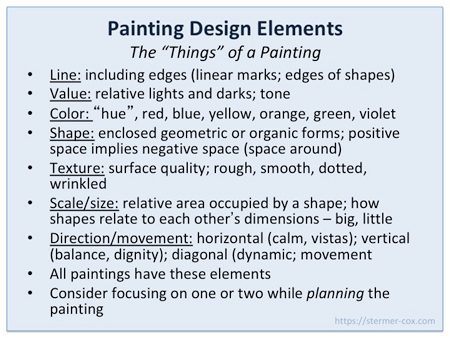 I came across Linda Kemp’s book on simplifying titled “Simplifying Design & Color for Artists”. I have not read it myself, but have looked at the table of contents and it looks good. Trying to simplify seems to be complicated. But, what I’m seeking is clarity. And, low and behold, to simplify can mean to seek clarity. Another brain loop! But, this is where things get sort of exciting, if you can stay with me. Clarity and understanding are part of the definition for simplifying or simplicity. Its All About Artist Intent. You might ask the question, “Why is this important at all?” For me, its all about what an artist wants to say and how to say it. To summarize, then, the term “to simplify” fits in the design lexicon as an action. The action is to reduce or simplify one of the design elements. In doing so, the artist is working to create unity, of the design principles. Thank you for stopping by. Please feel free to leave a comment if you like! Warm regards. Peggy. Still contemplating how to simplify!